Last week I visited Ljubljana on a (too) short business trip. I had a good impression on my first visit in 2002, and this time confirmed that the city is a nice place to spend a few days. On this trip I really only had time to walk around in the small historic city center. There is a small river running through the center of Ljubljana, on one side are lots of buildings from the middle ages on the other from the Jugendstil period mixed up with some non descript modern buildings. 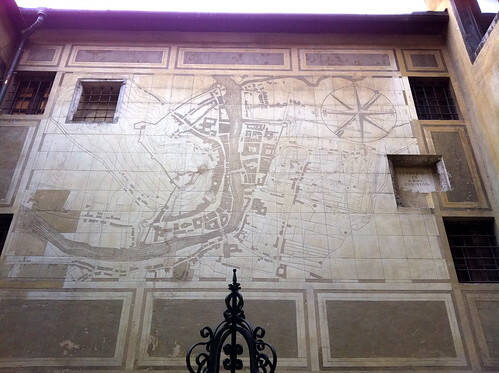 Here’s a map of the city that is on the wall in the City Hall courtyard. The castle and older part of the city is on the left side, the newer part of the city is on the right (although the map is from the middle ages so on the right side are only buildings along the river and farm plots). It’s fun to walk around through the market place: there is an outdoor market in a large square and a long building along the river with lots of small shops. One market building has baked goods, another has meat, another milk products. The shops are connected inside the long narrow building. Everything looked great. 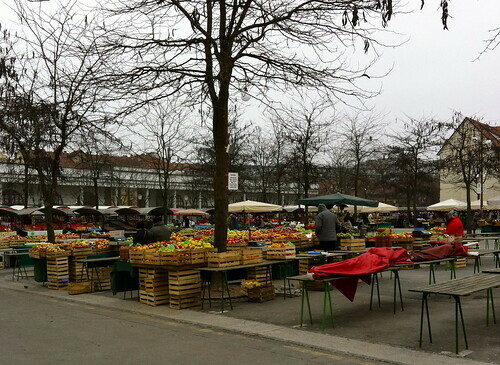 Here’s a photo of the open air market, the market building is in the background. We ate in two notable restaurants (sorry I did not take photos of the food!) both of which were located on the pedestrian streets that run along the river. The restaurant Most is at Petkovskovo nabrezje 21. We had an excellent dinner here that combined Italian with traditional Slovenian food. They also had many Slovene wines that looked great but since I was suffering from a cold I needed to stick with beer. I did take a sip of a really nice local red wine that reminded me of Barollo, quite tasty. 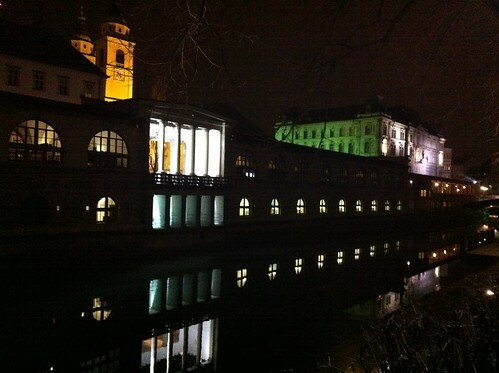 Here’s a photo of the market building at night with river reflections when we left the Most restaurant. For lunch the next day we stopped at Pri Vitezu restaurant at Breg 18 (the other end of the river walk from Most). It was also fantastic. We ate so much at lunch that I could not eat dinner that night. We started with a pasta dish that was a combination between gnocchi and spätzle (two of my favourite things!) in a meat sauce – perfect for a cold day. Then a turkey roulade. And topped off with a traditional layer cake made of several different things: poppy seed cake, apple filling, sponge cake and several types of frosting (our host told us that the piece we received was about 1/4 the size of a normal piece and that everyone had their own special recipe for what layers were included). We waddled along for the rest of our tour. Pri Vitezu was also interesting because of the quality of their wine list. I noticed that they had bottles of Ridge Vineyards 1996 Cabernet Sauvignon wine. It’s rare to see Ridge outside California and so it looks like the owners really care about wine. Our walk took us along the river side where Ljubljana has slowly created non motorised zones. It’s wonderful to walk along the banks of the river and take in the scenery and people watch (the area is full of cafes and students). The walk took us to the three bridges area which seems to be the centre of the city. Here you can see examples of Jugendstil architecture and look up the mountain to the castle. Here’s a photo of the Dragon Bridge, on the other side of the market from the three bridges area. The Ljubljana city coat of arms features a dragon since they were thought to come from the marshy areas surrounding the city. 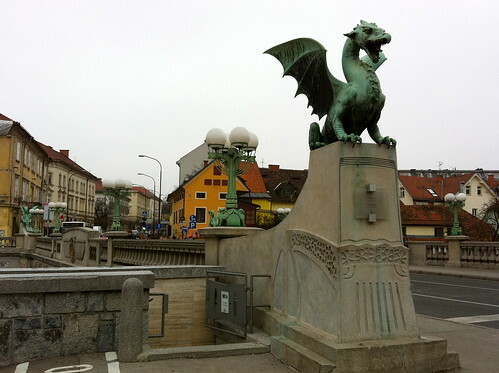 I love these dragon sculptures and the Jugendstil design of the bridge (see my Ljubljana photos on flickr). We stayed at the Hotel Slon which was very nice. Especially nice was the excellent breakfast. Also, even though it was a buffet the servers went out of their way to help you by bringing coffee, tea and more food. They were really nice. In summary, I hope to visit again soon. 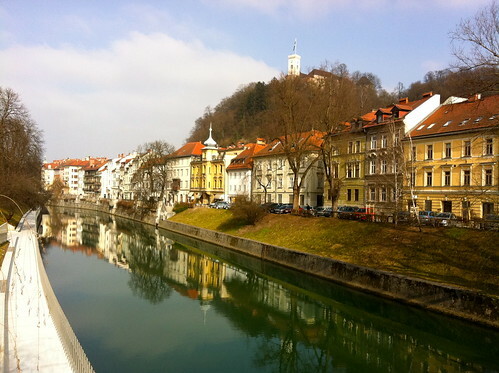 Ljubljana is a wonderful place to spend a few days relaxing and enjoying life on the riverside. Here’s a link to all my flickr photos of Ljubljana.